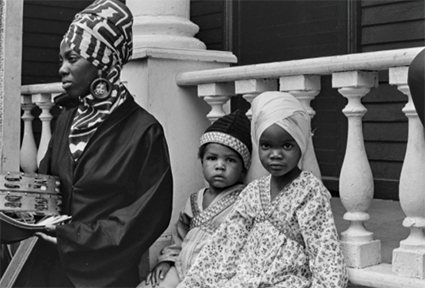 Mother and children, #159, 1968. Ruth-Marion Baruch, from The Black Panthers series. (Special Collections & Archives, University Library, UC Santa Cruz). Couple at the cemetery, Last Memorial Day, 1956. Pirkle Jones, from Death of a Valley (Special Collections & Archives, University Library, UC Santa Cruz). 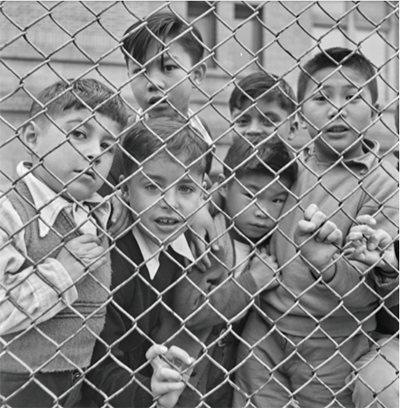 Children behind chain fence, 1948. Ruth-Marion Baruch, from Children, They Grow in the City (Special Collections & Archives, University Library, UC Santa Cruz). Thousands of previously unseen photographs from The Pirkle Jones and Ruth-Marion Baruch Collection at UC Santa Cruz are now available online to the general public, thanks to a collaboration between the campus library and the California Digital Library (CDL). The University Library has completed the scanning of 6,360 original negatives from the historical archive, which was donated to UC Santa Cruz in 2016. The work was done this summer as part of a mass digitization pilot project sponsored by the CDL. 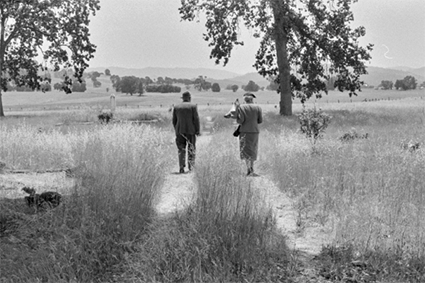 The Pirkle Jones and Ruth-Marion Baruch Collection documents the people, landscape, and politics of California in the mid-20th century. Capturing the history of California during a time of enormous social change, it is an extraordinary resource for scholars, students, and the public. UC Santa Cruz holds the copyright for all of Baruch and Jones’ work. Most of these images were never printed by the photographers, and their publication online is now the first time they will be viewed by the public. “The collection is a boon--not just to UCSC, but to UC and the state--and its digitization will increase its use and the prominence of both the campus and the UC system,” noted University Librarian Elizabeth Cowell. Three groups of images were selected for the project from the UCSC collection, which includes more than 12,000 photographic prints and 30,000 negatives from the noted California photographers. They include the Black Panthers Series--taken by Baruch and Jones in 1968 after they were given unprecedented access to the inner circle of the Party’s leadership; the Death of a Valley series--shot by Jones documenting the last year of the Berryessa Valley in 1956 before it was flooded to create a new reservoir; and additional photos focusing on San Francisco and the greater Bay Area--taken by Baruch, dating from 1944 to 1978. A team from Pixel Acuity set up the digital scanning on-site at McHenry Library, faced with the technical challenge of scanning a large volume of unique material and working with never before seen images. Partnering with the California Digital Library in a digitization pilot project allowed UC Santa Cruz to leverage the CDL’s expertise in contract and vendor management, and benefitted the CDL and other UC libraries by developing workflows, best practices, and documentation that can be applied to other vendor digitization projects. “This project has been a huge success and has greatly helped CDL in our work to refine a general approach to digitization that demonstrates that optimal quality, mass scale digitization of cultural heritage materials can be achieved in a very fast and cost effective manner,” noted Paul Fogel of the California Digital Library.